Note to readers who reach this page from Ginia Bellafante's column: nearly all my tours are small groups--just a handful of people. Nor do I operate daily tours through her neighborhood (as some do). Thus I'm not loudly lecturing unruly groups carrying selfie sticks. Here's my more extensive response. Brooklyn's celebrated (and sniped at) neighborhood, full of great architecture, next to a terrific park, and with a history of social activism and more. Yes, Brooklyn 101 provides an introduction to Park Slope, but it's well worth a full 2.5 hours. I lived for some 17 years in the neighborhood, and have volunteered for numerous Park Slope House Tours. I know why some people mock Park Slope, and I know why it consistently wins honors, such as New York magazine's designation as the city's "best" neighborhood, and why it has become increasingly unaffordable. 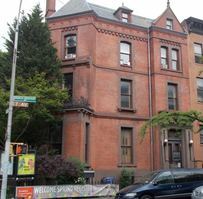 It is currently home to both Mayor Bill de Blasio and New York's senior Senator, Chuck Schumer. The tour includes a more extensive look at the western and southern parts of Park Slope, including blocks known for Victorian-era architecture. We meet in the area of Brooklyn's magnificent Grand Army Plaza, the psychic center of Brooklyn. We can make a more extensive visit to Prospect Park, and even dip into the adjacent neighborhood of Prospect Heights. The tour includes a visit to Park Slope's main shopping street, Seventh Avenue, then the new Restaurant Row and snacking/shopping district on Fifth Avenue, a far more diverse and vibrant area. We even visit the Fourth Avenue corridor, home to new development, some thoughtful, much not. We will continue south to the historically more working-class South Slope, walking past an old clock factory since turned into housing and streets evoked by the writer Pete Hamill. Another can include a walk west toward the Gowanus Canal and the "emerging" (and contested) Gowanus neighborhood, home to new businesses and development projects on previously industrial/commercial blocks, all near a canal with a rather un-salubrious reputation.